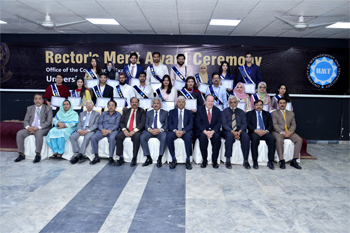 Dr Muhammad Aslam presented Rector’s Merit Awards to 108 students from the School of Business and Economics, School of Social Sciences and Humanities, School of Systems and Technology, School of Science, School of Health Sciences, School of Engineering, School of Textile and Design, School of Commerce and Accountancy, School of Law and Policy, School of Architecture and Planning, School of Professional Advancement, Institute of Aviation Studies, and Institute of Communication and Cultural Studies. 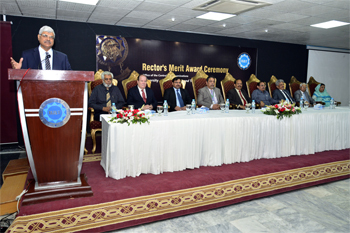 Dr Aslam congratulated the UMT students on their meritorious academic performance and added that only committed students who are focused on their studies will shape the future of the nation. He advised them to keep excelling in their studies and set even higher standards of achievement. 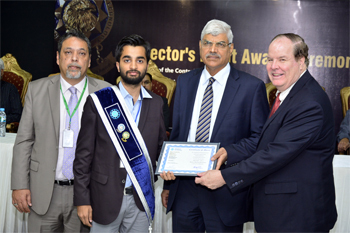 The ceremony was organized by the Office of Controller Examinations. 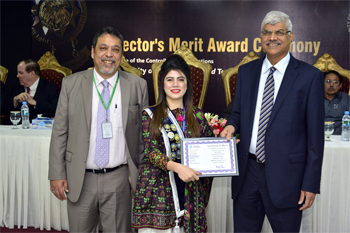 Deans, Directors and senior faculty members were present on the occasion to encourage the students to give their best to their studies.